Posted on Tuesday, November 1st, 2011 at 10:56 am. As consumers and businesses become more environmentally aware, many people are pointing toward consumer and retail packaging as one of the leading sources of all things wasteful. A new grocery store in Austin is currently in the works, and when it opens, it will be the first package-free grocery store in the United States. While many people may think this is the step in a greener direction, the fact remains that food packaging is still absolutely necessary in order to keep food products safe and fresh. There is more to packaging than simply a container and a few colorful graphics. Food packaging companies maintain processes that must meet strict safety and product requirements. Safety. Food packaging plays a huge role when it comes to food product safety. The packaging around a food item is customized and designed to ensure the food is kept safe from contamination throughout the entire process – from packaging and shipping to the retail shelf and home storage. Zero-packaging grocery stores encourage shoppers to bring their own containers and fill up on bulk items; however, how much do consumers know about the safety of the containers they bring from home? Food packaging companies are experts in designing packages that best meet food product safety needs. Food quality. Depending on the ingredients, some food products last longer on the shelf than others. One of the biggest factors contributing to shelf stability is food packaging. The manner in which the product is packaged and sealed has a big effect on how long the food will last. Ineffective food packaging, or no packaging at all, can lead to greater and faster food spoilage. This is especially true of organic food ingredients, which often have fewer preservatives and ingredients for prolonging shelf life. Convenience. Food packaging also contributes largely to customer convenience. With the right food packaging, customers can easily carry and store their food products, and packages that are easy to open and close make the products much more accessible. In addition, food packaging provides product information regarding nutrition, ingredients and manufacturing, so that customers can know exactly what is in their food and where it came from. Getting rid of food packaging altogether isn’t the right solution for a safer environment; rather, eliminating packaging can affect food’s safety, quality and convenience. PacMoore is a leading food packaging company committed to meeting specific product requirements, with advanced equipment and an expert staff. 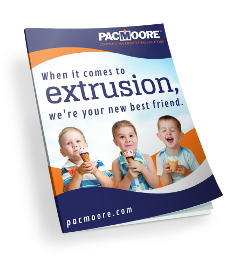 For more information, visit www.PacMoore.com.